Obviously, I love web generators and the kind of interactive paradigm of both automagical creativity and constrained stupidity that they represent. I've written at least one peer-reviewed scholarly article, which plays homage to the genre. Now, here comes the Geocities-izer, which promises to "make any webpage look like it was made by a 13 year-old in 1996." Geocities may be defunct, but its aesthetic lives on. 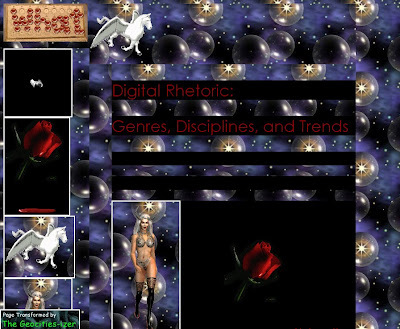 Look at how much better my digitalrhetoric.org page looks.